The Knowledge Guru platform has evolved quite a bit over the last few months. We unveiled the new “Quest” game type in October, which added an entirely new gameplay experience and performance challenges. Most importantly, Quest uses the same back-end database and spaced repetition principles that are critical to the Knowledge Guru approach. 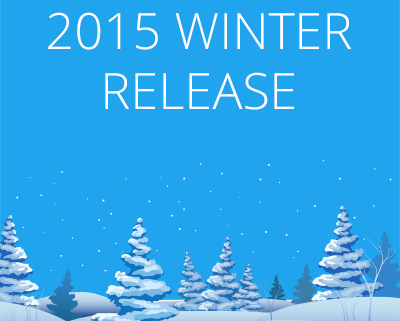 We think every release is exciting, but Winter ’15 is especially great. We collected customer needs and feedback to add new features that make Knowledge Guru a more powerful learning tool… all while improving load times and speed. You asked, we listened. 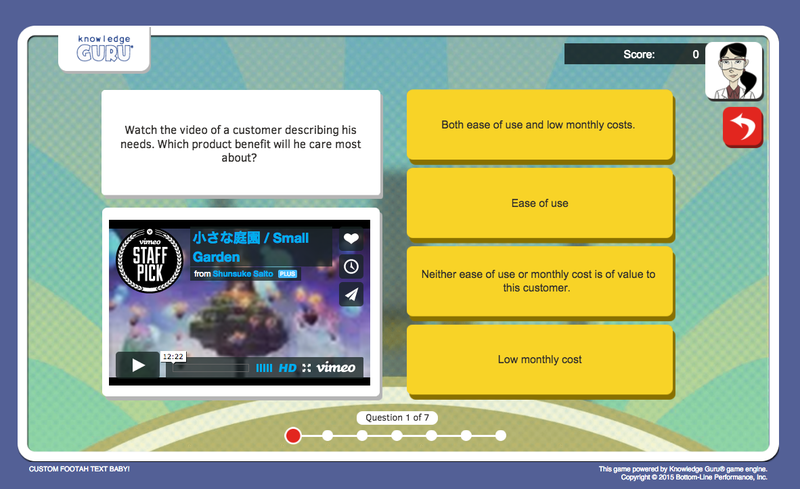 Now, you can embed video directly into your Knowledge Guru questions. Choose between text-based, audio or video questions throughout your games. The Knowledge Guru database can now create a personalized learning experience for players based on their learning needs. Mini-games at the end of each World in the Quest game type pull questions that players missed on the first attempt. 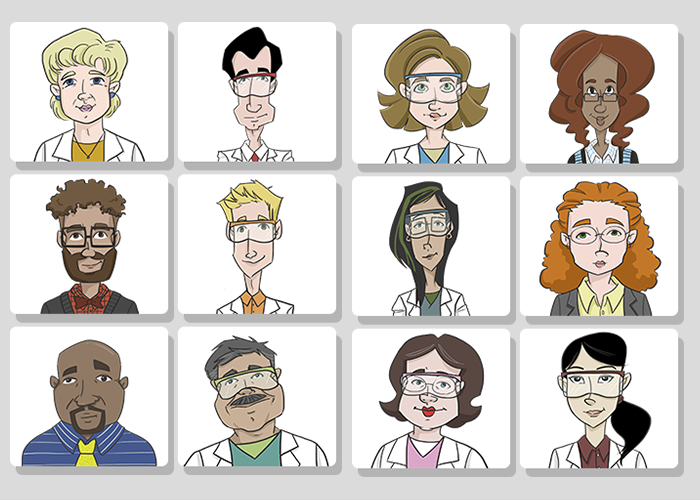 We have created an all-new Quest character pack especially for our clients who work in healthcare settings. We can create a character pack for any industry you can imagine. Just ask! We have migrated the entire Knowledge Guru database to Amazon cloud servers. The result? Faster load times for both players and authors, no matter where they are in the world. Need to load players into your game fast? Do your employees not have a company email? No problem. In addition to self registration, you can now mass upload your players into the Knowledge Guru database. Questions can be mass uploaded as well, making it easy to send subject matter experts a spreadsheet of content to review instead of having them play through your entire game. 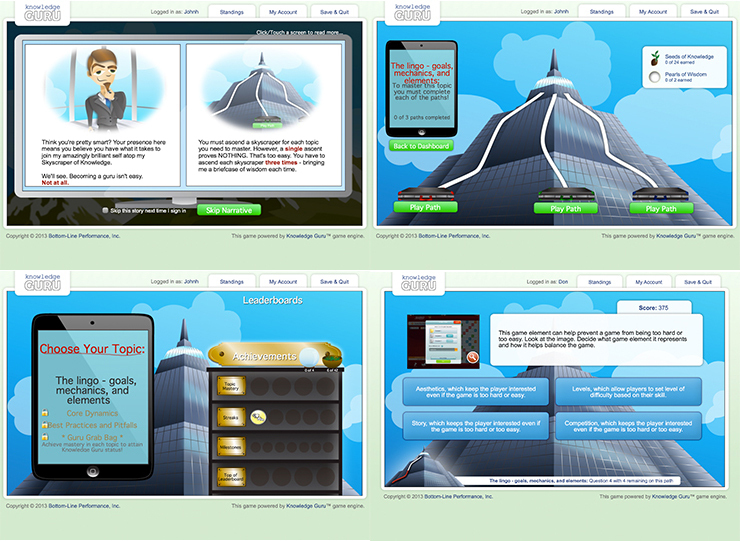 Knowledge Guru games can already be customized with corporate logos and branding… and some customers have even set up custom integrations with their own learning portals. 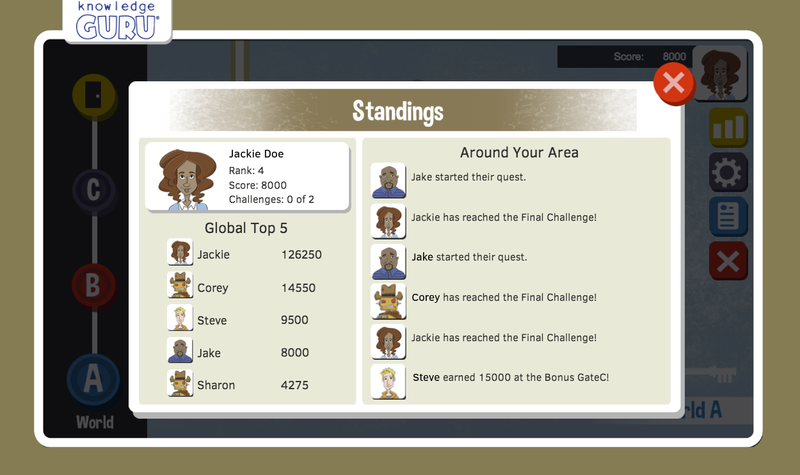 Now we have made Knowledge Guru games easy to embed within an iFrame. This feature is ideal for customers who wish to create a seamless branding experience for their learners. Knowledge Guru is now compatible with virtually all LMS systems. Administrators can export their games as SCORM 1.2 or 2004 packages… or host the game in the cloud for expanded gameplay features and deep tracking. Experience API support is also still available across all plans. Knowledge Guru customers have already had new features added to their accounts. To see what’s new with Knowledge Guru, register for our Winter Release webinar, held on February 18th at 1 pm EST, 10 am PST. Don’t worry… we’ll send you a recording if you cannot attend. 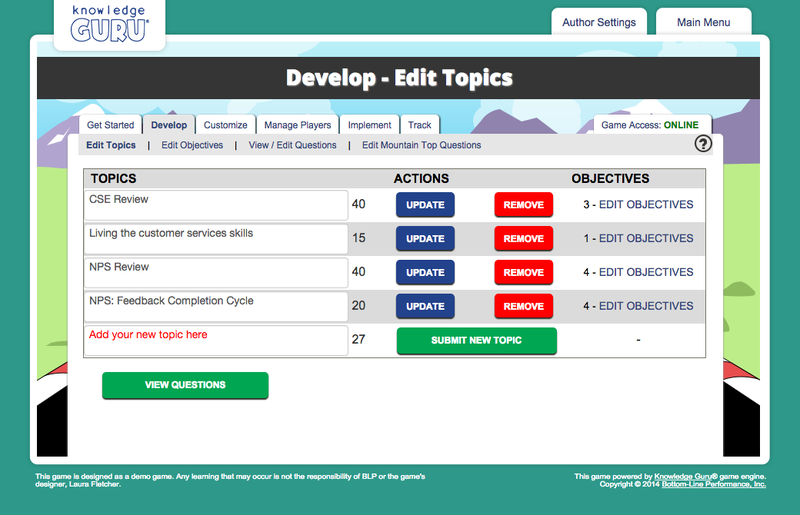 Last October, we unveiled the new Knowledge Guru “Quest’ game type at DevLearn in Las Vegas. We sent participants on an interactive quest that included our Fall Release announcement, a meet-up breakfast for those interested in serious games, an all-day workshop with Sharon Boller and Karl Kapp and much more. Free t-shirts were involved, too. If you missed ourDevLearn Quest, you can follow the journey here. 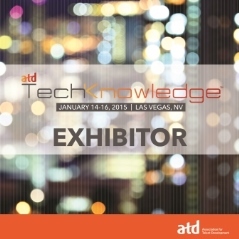 This week, we are excited to head back to Las Vegas and continue the quest at ATD TechKnowledge 2015. It’s yet another opportunity to see a live demo of the new “Quest” game type, learn how the spacing and repetition in Knowledge Guru lead to long-term employee retention and meet in person with some members of the Bottom-Line Performance team. As a special treat, we will be reveal the new features that will be part of Knowledge Guru’s Winter Release, coming in February. We will announce these features are part of a live demo in our Solution Session. In the expo, booth #305. Come set up a personal demo of Knowledge Guru and get a free T-Shirt! On Twitter, tweeting as @TheKGuru. It’s a great way to follow along if you cannot attend the conference! Whether you’ll see us in Vegas or not, our Winter Release webinar will be your first chance to see the newest features in action. We’ll show off the Quest game type and demonstrate the improvements we’ve made that take the platform even further. You’ll even get a preview of what to expect from the Knowledge Guru platform in 2015! The Winter Release Webinar will be held on Wednesday, February 18th at 1 pm EST. If you cannot attend but want to see what’s new, register anyway! We will send a recording after the webinar is complete. Use the form on the right to register. ATD TechKnowledge is just the start of a busy year for the BLP team. Next, we will be at the HCM Excellence Conference 2015, hosted by Brandon Hall Group, January 28-30th in Fort Lauderdale, Florida. We will be accepting all three of the Brandon Hall awards, including two gold honors, that Knowledge Guru received in 2014. Since the release of Knowledge Guru in 2012, our team has spent thousands of hours researching the science of learning and serious games. We’ve play tested dozens of games to see what mechanics work for learning. Most importantly, we’ve listened to our growing customer base to find out what features and functionality they need to make serious games a success in their organizations. All of this has led up to our Fall ’14 Release, the biggest Knowledge Guru release yet. Next week, we are unveiling the all-new Quest game type. It takes the Knowledge Guru platform to a new level. We’ll show off Quest at DevLearn 2014, October 29-31 in Las Vegas. 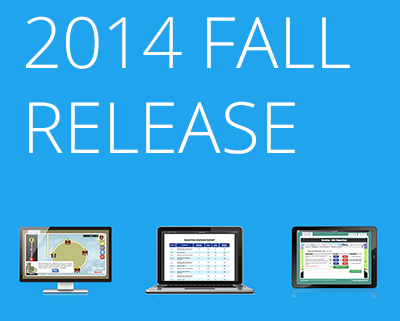 See the list of events, or simply register for the Fall ’14 Release webinar on November 6th. Quest is an all-new game type that uses the same game content as the original Knowledge Guru games, but in a new way. In Quest, players are on a journey to “unlock knowledge.” They travel through three worlds to do so. The original Knowledge Guru game has been renamed as Legend. Learn more about the difference between Quest and Legend here. 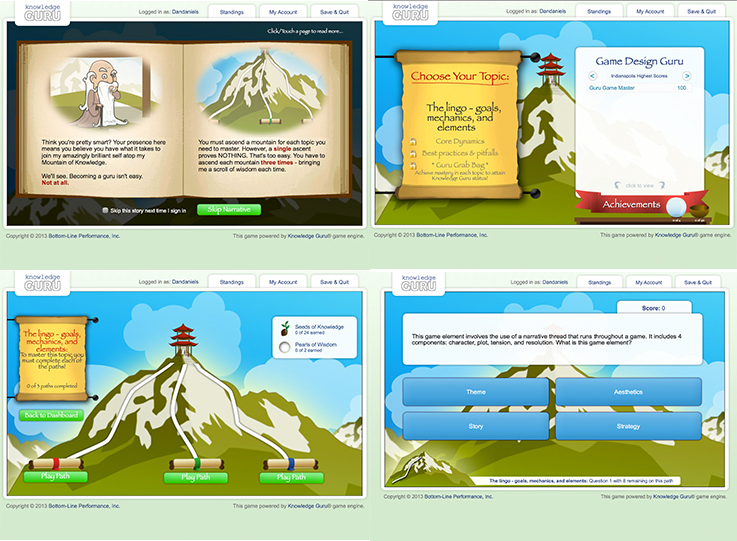 Players select an avatar to represent themselves… and a Guru to guide them through the game. The game environment is immersive and responsive. The interface just feels fun as players play, and the game mechanics encourage replayability. Players maximize their “star rating” on each topic and earn power-ups that impact their experience. Players vie for first place on the leaderboards while seeing a real-time stream of their colleagues completing challenges of their own. The “Bonus Gate” provides a mini game that is fun to play and actually integrated into the learning itself. This deepens the learning and improves retention. Connect gameplay to real-world challenges. You create the challenges; players complete them as part of the game. The game format has been structured to take advantage of the latest research on how memories are formed. You can even control the spacing for players by “locking” worlds for play on a later date. The game can send an email to players reminding them to return, if you’d like. Quest is launching with three different theme choices: Business, Space, and Island. That makes for 11 total theme options across both Knowledge Guru game types. Quest is not the only thing new this fall. The user interface has been optimized to truly “flow” through the game development process. The tabs across the top of the screen walk you through each step from getting creation to customization to implementation. It’s still simple to create a game; just add your content. We’ve added a short “Getting Started” video for both Quest and Legend game types that provide a three minute overview before you begin. We have also introduced a new, expanded Knowledge Base with tutorials that help you create your game. If the Knowledge Base is not enough, the new support ticketing system will get any issues resolved quickly. All of our admin reports have received a facelift. You’ll also find a new “Report Dashboard” that tells you, at a glance, how your game is going. 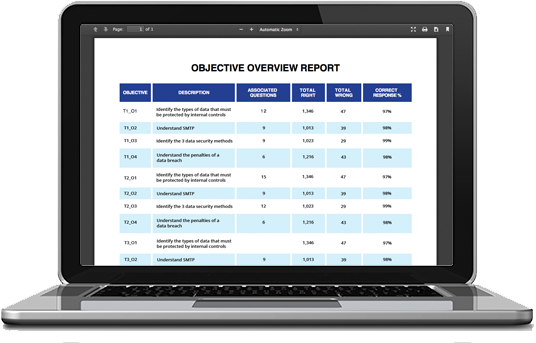 The new “Game Overview Report” combines several popular reports into one useful PDF. As always, all our reports can be exported to a CSV, too. We are showing off Quest in a free public webinar on Thursday, November 6th at 1 pm ET, 10 am PT. Even if you cannot attend, register to receive the recording. With more people using Knowledge Guru today than ever before, we’ve been hard at work creating resources to make the game creation process faster and easier. That’s why I’m pleased to announce the new Knowledge Guru Tutorial Library. We’ve taken every how-to resource we offer and consolidated them in one location. You’ll find the admin user guide, a sample design document, and even a Powerpoint template you can use to run a design meeting. You’ll also find a series of step by step tutorials, complete with screencasts that show you how to use the tool. Use the library in conjunction with our free instructional webinars, held every two weeks. I’ve seen some organizations take full advantage of these webinars by sending designers to almost every session. That’s what they’re here for, folks! 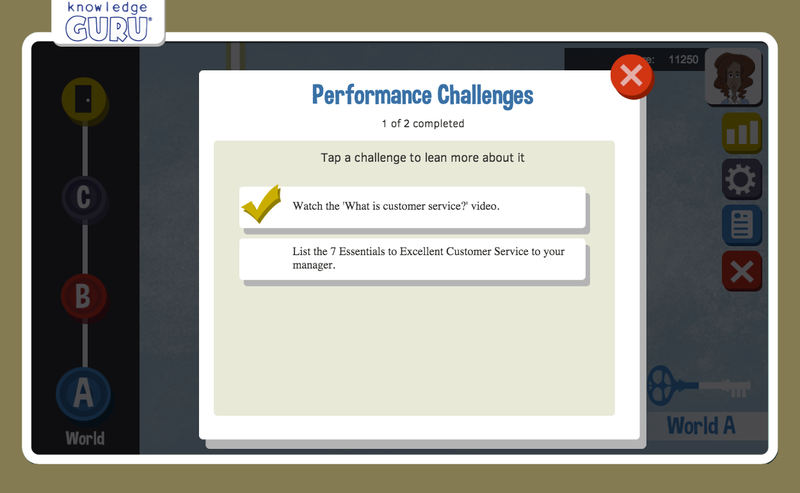 Our mission is to a) show you how games and gamification can help people learn and b) make it fast and simple to deploy a game-based learning solution in your organization. We’re constantly improving Knowledge Guru, and the tutorials we offer, to accomplish that mission. If you’d like a tutorial on a specific topic, let us know. Designing a game and creating measurable learning objectives. Using the basic features and functionality of the Game Creation Wizard. Writing iterative questions, or three questions that all teach the same thing. Writing effective distractors, or incorrect answers, for your questions. Incorporating image questions in your game. Tracking progress by learning objective, question, and individual user. I’m excited to unveil two new enhancements to the Knowledge Guru® product: two Business theme packs and tight Experience (Tin Can) API integration. 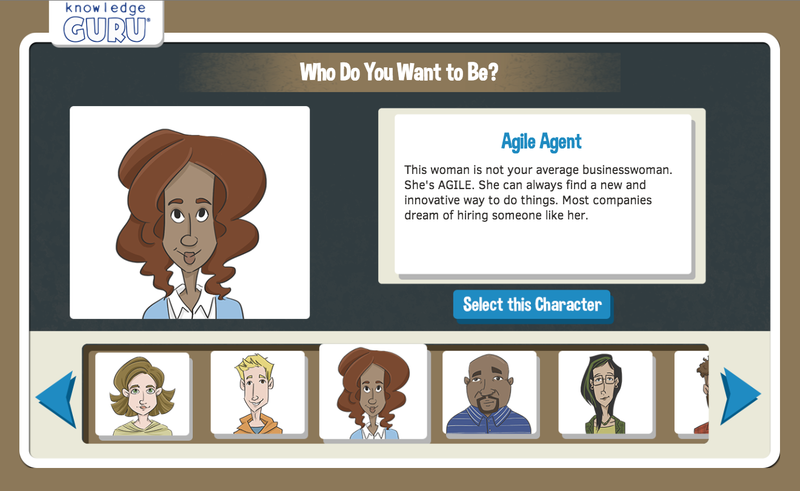 You can now create your own game in a business-themed world, with a businessman or businesswoman version of the Guru. …And when you’re done with that, you can easily connect your game to an LRS like Scormcloud or WaxLRS to track all of your game data. We’ll be showcasing these new enhancements at this year’s DevLearn Conference in Las Vegas, Nevada with a Learning Stage session and expo booth presence. 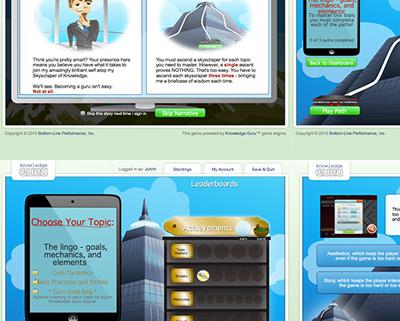 The business theme packs give added flexibility to organizations who want to use Knowledge Guru games, but may not be able to use the standard Fantasy theme within their company culture. In Knowledge Guru’s Fantasy theme, players climb mountain paths to deliver scrolls to the Guru in his pagoda to become Knowledge Gurus themselves. It’s a fun setting… but some organizations need a game with a more realistic aesthetic. 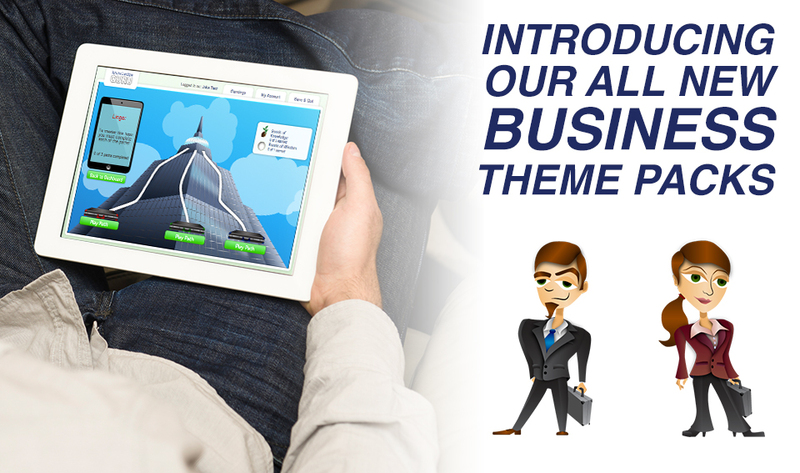 That’s why we created the new Business themes, where players try and join the Guru, now a dashing businessman or businesswoman, atop his Skyscraper of Knowledge. Instead of scrolls, they deliver briefcases. Where storybooks were once used, we’ve added LCD monitors and tablets. The new themes put players in a professional, business setting while still utilizing quality aesthetics and attractive visuals. Just because the game has a more “serious” look does not mean it can’t look good, too. Other than the theme itself, the game functions exactly the same as the Fantasy version. The spaced learning, repetition, and immediate feedback are still built into the game. Game creation and editing works the same, too. Knowledge Guru was the first learning game to be Experience (Tin Can) API compliant, all the way back in October 2012 before the specification reached 1.0. Now, we’ve added an easy-to-use page to the admin dashboard where you can easily input your LRS settings and connect the game for tracking purposes. Most LMS’s are not Experience API compliant, and you will need an LRS to use this feature… but the Experience API spec will eventually replace SCORM as the standard for online learning. By adding this tight integration now, we’re helping you stay ahead of the game. If you’re already using a product like Scormcloud or WaxLRS, you can start tracking game data in your LMS right away. The Experience API control panel was rolled out to all customers across the system this month, and you can start using it right away. For customers who purchased games for future use that do not yet have content, we can easily change empty games from the Fantasy theme to one of the Business themes. Just contact us.